Garnet Hill Lodge is able to offer guided adventures in the Adirondack Park. Whether you are looking for a half day canoe trip or a multi-day fishing, hiking or hunting excursion, let us help you organize a memorable adventure with one of Adirondack Mountain and Stream’s Adirondack guides. 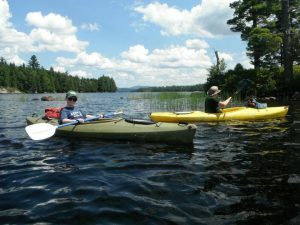 Adirondack Mountain and Stream Guide Service is a four-season guide service, featuring guides that live, work, and thrive right here in the Adirondack Mountains and love to help others enjoy the many experiences of the great outdoors. To find out more about their services visit their website, see the blog or view our video. Enjoy a guided canoe trip in the heart of the Adirondacks. The Adirondacks offer an endless number of excellent canoe trips on unspoiled rivers and lakes. Your guided canoe trip in the heart of the Adirondacks can last a few hours or a few days, it’s your choice. The guides we work with are licensed by the state and are also people who love the outdoors! While on your trip our guides will make sure you enjoy your experience to the fullest. The beauty of the Adirondacks is having the ability to travel into remote ponds and lakes and not be disturbed by other fishermen, giving you that true backcountry experience. There is no greater feeling than hiking into a backcountry pond with an ultra light canoe and catching native Adirondack trout, whether it be with a fly rod or spinning gear. 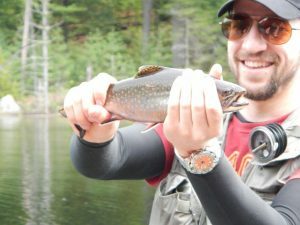 The most successful trout fishing here in the Adirondacks is from late April into the first of June. Contact us or call (518)251-3762 to set up a backcountry fishing trip. Garnet Hill Lodge is an ideal base for your hunting excursions, enabling you to hunt day to day while enjoying the comforts that the Lodge has to offer. The Adirondack park is made up of huge tracts of forest and wilderness areas. The park is home to numerous animal species including white tail deer, hare, grouse and woodcock. Contact Adirondack Mountain and Stream or give them a call at 518 251 3762. One-day fishing and canoeing trips may be booked directly through Garnet Hill Lodge. Reserve your room, then visit our excursions page to add-on a day of guided fishing or canoeing.